Scuba diving is life. Everything else is a surface interval. Scuba diving is fun, period. Giving divers a chance to take an insight into the mysteriously magical underwater world, scuba diving simply embodies excitement and exhilaration. Offering you the freedom to unleash your fantasies and explore your surroundings, it is a safe way of getting closer to nature and re-establishing the harmony that once existed between nature and mankind. Scuba diving is a highly sought after sport that is keenly pursued by millions across the globe. Apart from the wide array of reasons that allure holiday-makers to Los Roques, scuba diving is the primary motive of about one third of tourists coming here. Promising to be an exceptional experience for everyone, scuba diving in Los Roques is unlike any other place. Los Roques is not only blessed with natural beauty over the surface but underwater beauty as well. Those who have experienced it just cannot help speaking volumes of its charm. The uniqueness of the marine life, the versatile mangroves, the striking coral reefs and the spectacular water plants all contribute to make Los Roques the ultimate destination for scuba diving. While divers cannot stop ranting and raving about the invigorating feeling that one experiences during scuba diving, the hazards are there all the same leading to scuba diving accidents. With proper training and strict adherence to the outlined rules and regulations, one can easily avoid any mishaps. Scuba diving accidents are not actually accidents but rather the diverÔÇÖs failure to follow the safety practices appropriately. Scuba diving rules and regulations are carefully formulated so as to significantly reduce chances of any accidents. Only by following the rules properly will you be able to enjoy the true joys that scuba diving has to offer. Some of the wrong practices that divers often indulge into include deep air diving, diving alone, diving in a suit that is unfit, diving when you are overweight, diving without proper training etc. Good scuba divers are those who do not take up challenges that go beyond their training. Making continuous efforts to improve your diving is something different but trying to do things that are recommended only for the more experienced and properly trained divers is an entirely different story. In order to avoid accidents, one should try to stay in the best shape as well. The point here is not that obese or overweight people should never try scuba diving but maintaining your shape is something that goes to your advantage. 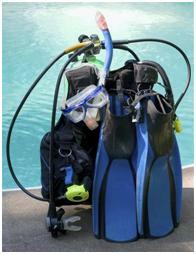 Scuba diving is enlivening and with proper care, accidents of any sort can be easily avoided. Accidents caused by equipment failure are not something common to come across. One should, therefore, take into consideration all the enlisted safety practices and rules to make the most out of this recreational activity.